Welcome to another wonderful color challenge from the CR84FN Challenge Blog! Thanks so much to those of you who played along with us for the last challenge, it's always wonderful to see how everyone uses the color challenges! The next two week color challenge is Steel Blue, Gray and Yellow. It took me some searching through my papers, but I found the beautiful colors in the My Minds Eye Lost and Found Sunshine paper pad and added in a strip (the measuring tape) from Prima's Printery collection. 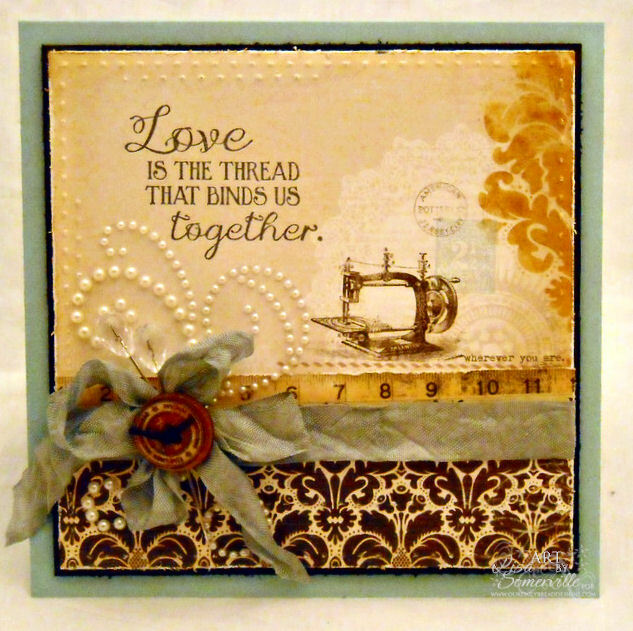 I thought the sentiment from Our Daily Bread Designs Sewn with Love worked perfectly with the Sewing Machine image on the MME papers. I stamped the sentiment in Gray using a SAMJ for placement. To add some texture I used the Scor-Bug Embosser along with the Scor-Pal, I'll definitely be adding this to more of my cards! To embellish my card, I dyed some Seam Binding with Ranger Distress Stain in Weathered Wood, Zva Creative Pearls, Prima Bobbin and May Road Trinket Pins. 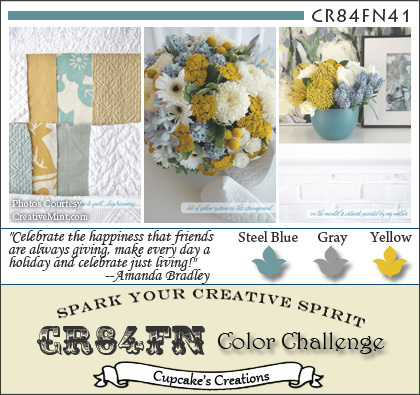 Here's this weeks color inspiration, we'd love for you to play along with us at CR84FN, you can find all the details here on how to enter. If you upload to any online gallery please use keyword CR84FN41 so we can find your creations! Gorgeous- Masterpiece!!! I LOVE your take on the color challenge! A real vintage/shabby chic feel to your card - I think the papers are fabulous and I do like the pearl flourish with the ribbon and button detail. The sentiment and focal image are just super! Such a beautiful card Lisa! Love the Vintage sewing machine and the pretty pearl flourish! Such an elegant Vintage beauty! Oh so elegant! Love the papers you paired with your image and sentiment. Sew beautiful! Luv that bug! Absolutely beautiful creation Lisa!! LOVE how you've added the measuring tape with the ribbon. Just an all over gorgeous, vintage creation. Just my style!! So beautiful is this card! Love that vintage sewing machine, which looks just like the one I learned to sew on! Beautiful details! Have a great Sunday! Gorgeous, Lisa! Love how perfect the sentiment is with the lovely vintage sewing machine! Oh I love this Lisa! The sewing machine image is perfect and love the papers, ribbon and pearls. Gorgeous vintage card! Thanks for joining us at MAWTT Challenge! This is the prettiest card I have seen in a long while anywhere! It is truly one of my favorites. I love the whole look of it, so inspiring Lisa, thanks for sharing. Your card is stunning, suitable for framing, so many beautiful details. Lisa, LOVE that sentiment with the sewing machine! The pearl flourish and scor bug details are so FAB! LOVE the papers and bow, too! GORGEOUS card! I love the way you have combined these colors, so soft and warm even though it is a cooler palette. thanks for the inspiration. Wow I love this card so much Lisa, I have that paper pad and I can't wait to dig out that sheet with the sewing machine on- it's stunning! WOW, and double WOW! This is just an awesome card - just gorgeous! Love the vintage feel of this card! The ribbon and embellies are just perfect together! Very pretty! It looks like it was made with love! The embosser adds the perfect touch! This is such a beautiful card, I love it. Oh, how beautiful this is! I love the way you tied the sentiment in with the sewing machine image! And the patterns and colors add to the elegance. So elegant and quite pretty Lisa! The pearl flourish is a great accent to your vintage look card! Wow! So Elegantly Vintage! love the perfect details, the Seam binding, and tape measure are so perfect with your Vintage sewing machine! Just Wonderful!